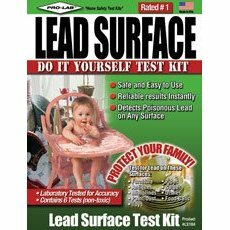 When I first learned about lead in children’s lunch boxes, I rushed to the hardware store to buy my own Home Lead Test Kit. I was concerned about my daughter’s commercial character backpack (which thankfully we no longer have), and we conducted our own Eco Child’s Play lead testing experiment. The results were negative, but now, I have learned that home lead test kits may not be accurate, thus neither was our experiment’s results reliable. Our conclusion, that they can be limited but useful screening tools to identify lead in household products, is different from the Consumer Product Safety Commission’s recent announcement that consumers should not use these products to find lead in their homes. Our differences lie not as much in the testing itself as in the interpretation of the data. Here’s how we came to our conclusions and why we believe parents should consider these kits as a helpful tool for screening household products. Hopefully, I can stop ranting about lead for awhile and move onto other issues. The important thing to be mindful of is that you must be persistent….